It was a refreshing evening for members of the Law Students Association (LAWSA) of the National Open University of Nigeria (NOUN), Lagos Chapter. Lagos State, Hon. AfeezIpesa-Balogun, who was a Special Guest, among others. Amid the eating and drinking, Asogbon told the audience that they were also there to listen to a lecture, rub minds on their academic pursuit at NOUN and honor 25 members. After the sumptuous meals and the presentation of the awards, the palatial room of the NUT Pavilion in Alausa area of Ikeja was electrified in the joy of a successful outing. Before then, the Guest Speaker, Sowemimo, who is also the Secretary, Body of Senior Advocates of Nigeria (BOSAN), addressed the gathering. Pointing out that digital legal education is of utmost importance today to all lawyers, young and old, the legal luminary told the gathering that the digital legal process is not only now taking the centre stage in the country, it was turning a manifestation of a revolution or a transformation in the way legal services are to be rendered. Just as the applause occasioned by the lucid presentation receded, a thaw of silence enveloped the hall by the remark of the National President of LAWSA. Obano, who tried to take his colleagues through the struggle to ensure that they gain the recognition of the Council of Legal Education in Nigeria to make it possible for graduating law students of NOUN to be admitted to the Law School and get called up ultimately to the Bar to be able to practice, left a sad taste in the mouth. Assuring them his executive was working round the clock to ensure that the issue remains in the front burner, Obano took the students round the struggle from the National Assembly, through the National Association of Nigerian Students (NANS), to the table of the nation’s President, where the amended law of NOUN is awaiting assent to remove the encumbrances in the establishing Act of 1983 that have impacted negatively on the academic and professional prospects of NOUN students. 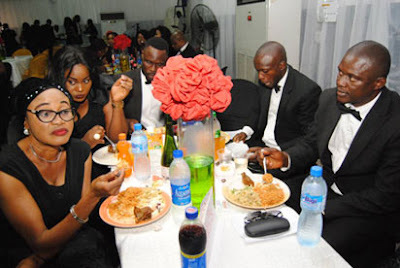 Cross section of LAWSA members dining amid uncertain future image credit:vanguard With several hundreds of students already graduated from the NOUN School of Law since the commencement of the university some 18 years ago, its law students have not gained recognition for admission into the Law School to make it possible for them to be called to the Bar and practice law, just as it is impossible for graduates of the school to participate in the National Youth Service Corps. The issues border on the perception of the university as ‘correspondence’ which gives the impression that its programmes are not full but part-time. The Council of Legal Education, in a position, entitled: ‘Non-Recognition of the LL.B Degree Programme of the National Open University of Nigeria,’ declared that the LL.B offered by NOUN does not have its approval. sponsored! The National Universities Commission (NUC) has also engaged in double speak on the issue, saying it gave NOUN the approval to run the programme while also arguing that it is one thing to give approval to mount a programme and another for it to get accreditation. Meanwhile, the reality today is that the university’s School of Law has established tutorial centres, engaged facilitators and lecturers while conducting examinations for its students. Beyond that, recent pronouncements of prominent citizens and organisations, including lawyers, on the matter give hope to the students. Former President OlusegunObasanjo, an alumnus of the university, had, during a recent visit to him by LAWSA, urged the students and graduates to be patient with the authorities, expressing optimism that all will be well. In the same light, speaking on the passage of the amendment to the Act establishing the school by the Senate, Senator Barau Jibrin, the Chairman of the Senate Committee on Tertiary Institutions and TETFUND, told his colleagues, while presenting the report of his Committee to plenary, “These two concepts, ‘correspondence’ and ‘part-time’ significantly affect the way the public views the programmes run by the university. The amendment would address the perception of the public about the university, regarding the contentious, ‘correspondence’ usage in the Act”.